Abstract Submission Deadline Extended to Tuesday, April 23rd! The deadline to submit an abstract for the Eleventh Annual Society for the Neurobiology of Language Meeting has been extended to Tuesday, April 23rd. You must be a current member of SNL to submit. The submission fee is $40.00. 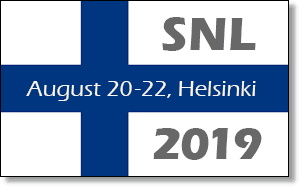 To submit an abstract, please Log In to your SNL Account or Create a New Account. For more information about submitting an abstract, please see Submissions Information.